There’s the snuggling-with-my-poo-bear hug parents share with their kids. There’s the fake hug kids give each other when forced by parents to make-up after a scuffle. There’s the newlywed I-don’t-know-how-I-ever-made-it-this-far-without-you hug. There’s the shoulder-to-shoulder-gotta-do-the-right-thing hug when men hug a woman who is not their wife, mother, or related to them in any way. There’s the I-want-to-squeeze-the-stuffing-out-of-you bear-hug when one is overjoyed to see another person. There is the tender, passionate, I-don’t-ever-want-to-let-you-go hug a woman gives her just-deployed husband. There’s the I-finally-get-to-meet-you cradling hug a mother gives her newborn for the first time. There’s the polite-obligatory hug where the hugger keeps the distance of a fluffy bed pillow between themselves and the huggee. There’s the my-heart-is-so-broken hug, the I-can’t-believe-this-has-happened hug, and the I-don’t-ever-want-to-lose-you-too hug all rolled into one like the one I gave my daughter shortly after I found out my son died in a motorcycle accident three years ago. Then there’s my least favorite of all. The kind of hugs I avoid at all cost. When a person reaches one arm around my neck and holds me in a semi-choke-hold with their tight squeeze. Those are brutal because they usually tweak my very sensitive neck. Because of too many rear-enders, I have had numerous whiplashes and suffer from neck aches and headaches. One particular lady’s semi-choke-hold hugs were so tight that twice after being hugged by her I had to visit my chiropractor @ $45 a visit. After the first time, I very politely mentioned to her about my sensitive neck and said that I preferred to have a simple hug, but apparently she forgot because she did it another time. Maybe I should have sent her the second bill. Now I just avoid her, which is sad because I don’t want to have to avoid her at all. She is not the only one who does the semi-choke-hold though, there have been other people. Now when someone new comes to hug me, I stiffen up hoping they aren’t a choke-hold hugger. PLEASE, PLEASE, NO CHOKE-HOLD HUGS. THANK YOU! My chiropractor doesn’t thank you but my neck sure does. When I described the semi-choke-hold to my chiropractor, he chuckled and said that he has had other patients have to come to him after similar types of “choke-hold hugs”. Personally, I think those hugs should be banned. For the most part, I really do enjoy hugs, but because as a child the only times I ever remember receiving a hug was shortly after one of my mother’s angry physical tirades against me, I wasn’t always a hug-fan. Her guilt-hugs always left me feeling resentful. I wondered what was so terribly wrong with me that would cause her to beat me, and then hug me. For most of my childhood I resented hugs and believed they were meant to make the hugger feel good at my expense. It didn’t occur to me that hugs were actually a good thing until my uncle, I hadn’t seen in many years, gave me loving hugs when I was ten years old, and then in my teens when I had my first sweet hug from my first boyfriend. “Mo- om, sto-op! !” And then, of course, I’d watch them rush off to play once released from my embrace because they couldn’t bear to miss one more second of fun. I was sad when they outgrew my hugs. I really miss those squirmy kid hugs. I now get hugs from my husband, some family, and, of course, friends; and I have decided I need to keep this twenty-second-hug thing in mind because I believe genuine hugs have a healing quality to them and I don’t want to miss out on any natural antidepressant or antianxiety goodness! I’m looking forward to the amazing hug I will get from Jesus once my life on earth is over. Wow, talk about antidepressant and antianxiety goodness! Woohoo! There seems to be and have been an awful lot of depression going on in this world for many years. Are we just not hugging each other long enough? 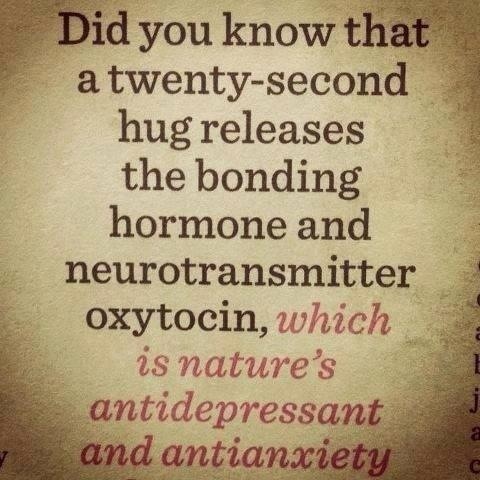 I’m no doctor, but I am prescribing everyone to go hug someone for a good twenty seconds, and get yourself a good dose of bonding hormones and neurotransmitter oxytocin. What kind of hugs do you like? Wishing you many, many hugs of the day.